In April 2015, my friend Dale Jacobson from Maryland came to visit for a week. Dale is interested in short lines and obscure railroads, and my home state of Oklahoma satisfies his longings in certain small respects. Dale and I first met in 1971 when he was stationed at Tinker Air Force Base in Oklahoma City, and I was on summer break after my second year of college. Since then we have corresponded and visited each other from time to time. I think Dale finds my libertarian viewpoint oddly stimulating, like a mammal with paddles for feet or an insect that eats itself. Unfortunately, 2015 was one of the wettest years on record in Oklahoma. I am writing this on December 27, 2015, and as of this date, the National Weather Service in Oklahoma City has recorded almost 56 inches of rain for the year. That is a lot of rain. It is raining as I type this sentence. So we had a lot of rain in April, but we were able to manage a little sunshine. Following is a photo-essay of our travels that week in April, in which we loaded ourselves and my dog Bear (aka Mighty Dog) into my Jeep and headed out in search of trains. 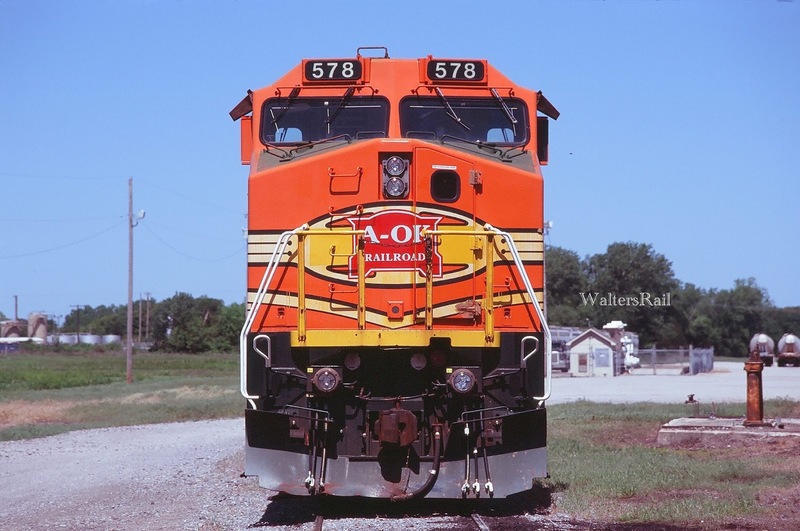 One of our goals was to obtain images of the Arkansas and Oklahoma Railroad, or the A-OK as it is known in these parts. 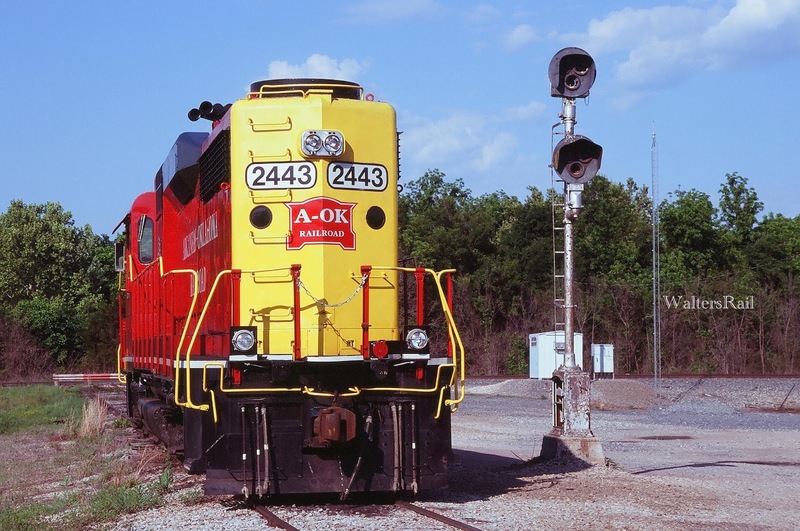 The A-OK runs on the old Rock Island line from Oklahoma City east to the Arkansas border at Howe, Oklahoma. This was originally the Choctaw and Memphis Line and covers some very scenic territory through the forests and mountains of eastern Oklahoma. Unfortunately, the A-OK runs very little traffic in the daylight other than switching auto-racks delivered from the Union Pacific in Oklahoma City. 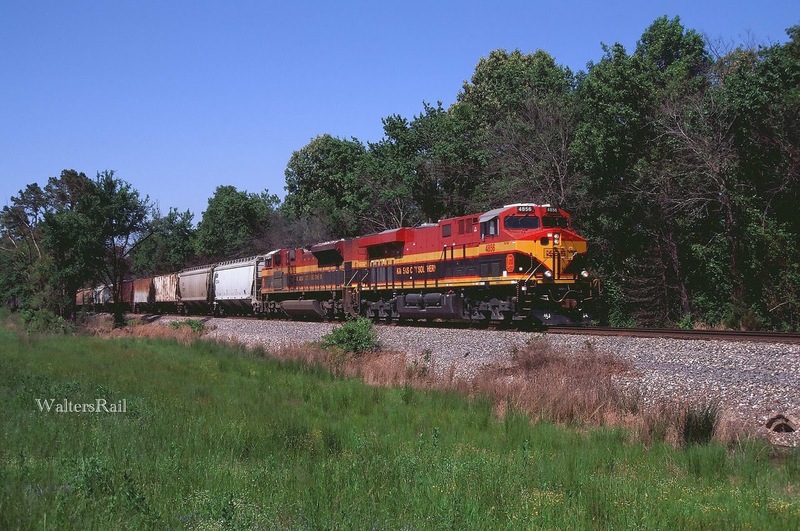 (The UP operates the old Rock Island line west from Oklahoma City to El Reno.) So try as we might, the only shots we obtained were of single, stationary units at various points along the railroad. Still, the units are so colorful that I include two images for reference purposes. The image above was taken at the A-OK's small facility in Shawnee. The image below was taken at the end of the line in Howe. Notice the guardrail behind the unit. 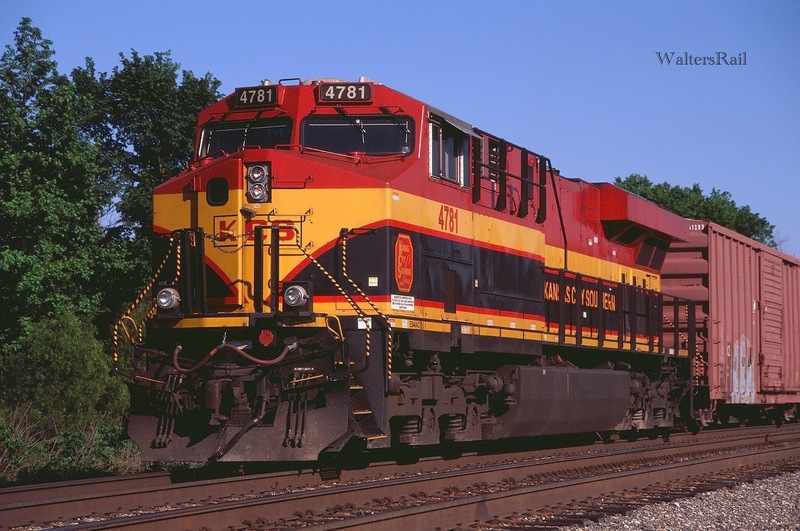 The other line in the picture is the Kansas City Southern. Dale also wanted to spend time on the BNSF Avard Subdivision. Although this is not a short line, the Avard Subdivision was for years a lonely branch line of the Frisco. 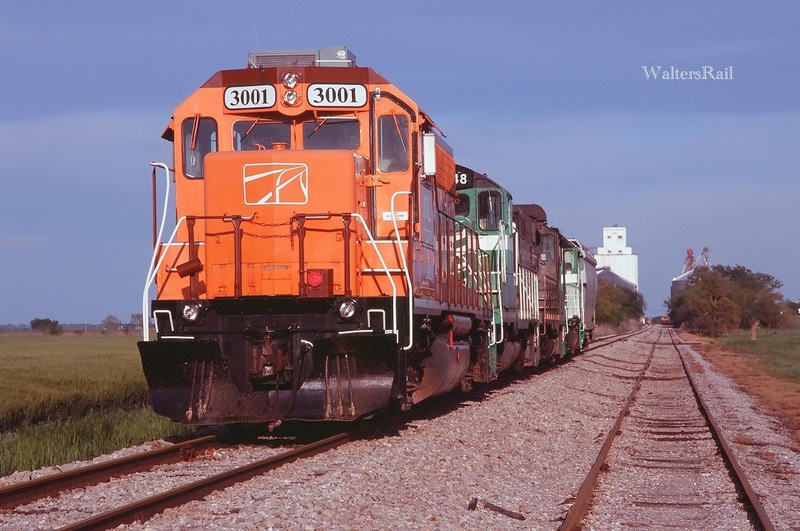 In the past several years, it has become a major east-west corridor for the BNSF. In 2013-2014, the subdivision was converted to Centralized Traffic Control and now, on a busy day, sees about one train per hour. 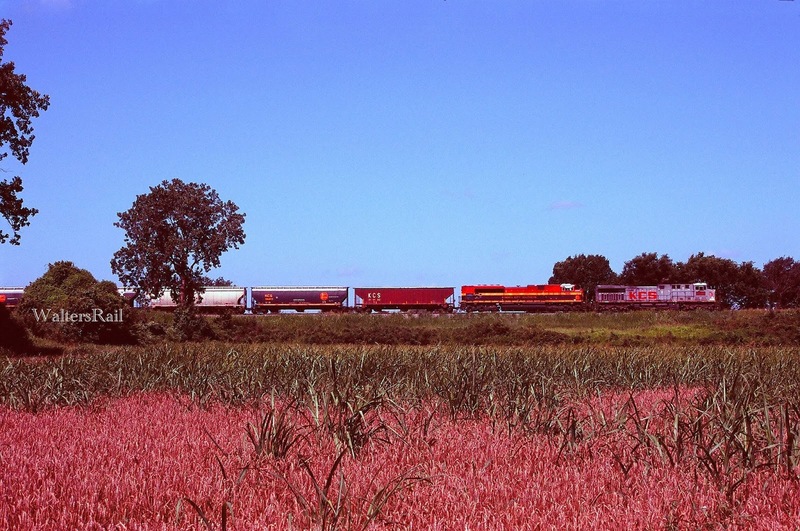 In years past, the AT&SF ran a branch line from Guthrie to Enid, Oklahoma, a major wheat terminal. 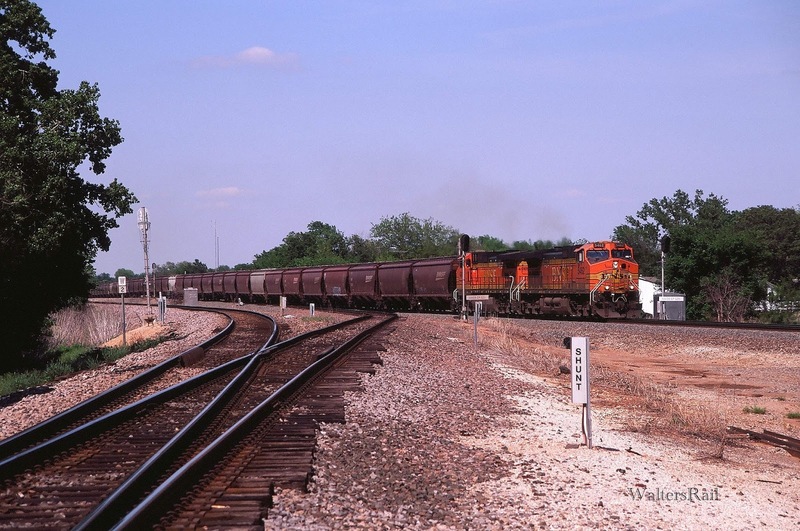 When the AT&SF and BN merged, that branch line became redundant and was abandoned from Guthrie to Fairmont, the intersection with the Avard Sub east from Tulsa. At Fairmont, westbound trains can stay on the old Frisco line into Enid or be diverted onto what remains of the old AT&SF line. In the image above, westbound stacks are diverting onto the old AT&SF tracks. Thus, from Fairmont to Enid, the Avard Sub is effectively double track. 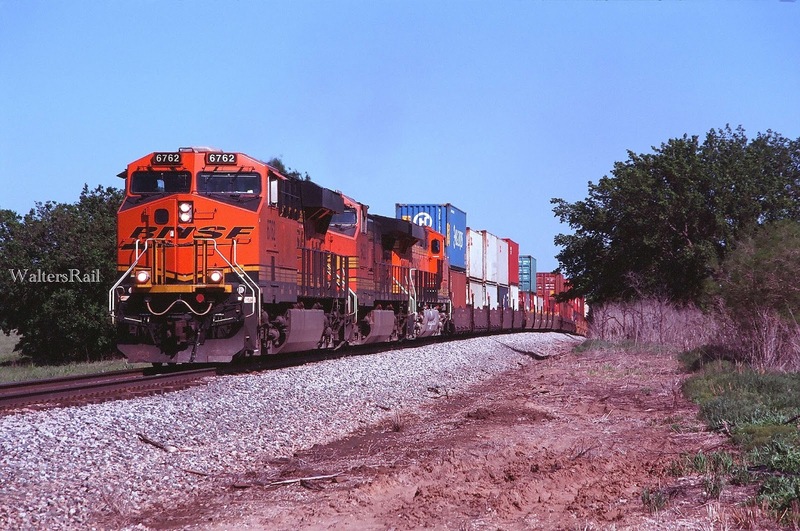 This is an eastbound Intermodal on the Avard Subdivision in Enid, Oklahoma. Dale and I did not plan to take any urban images, but this train appeared when we weren't expecting it. Enid is the largest city in northwestern Oklahoma. 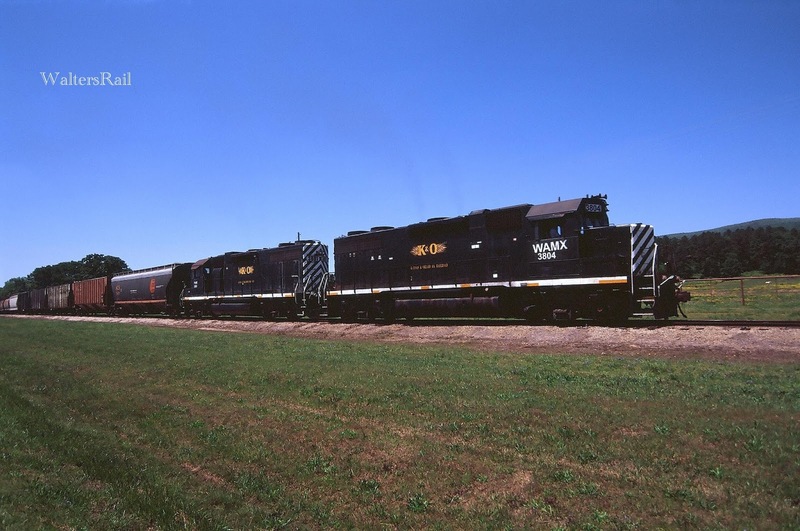 In addition to the Avard Sub, the town has a small Union Pacific yard (fka Chicago, Rock Island and Pacific). Like most Oklahoma towns, one can take shots in the city limits that appear to be located in the country, such as the one above. 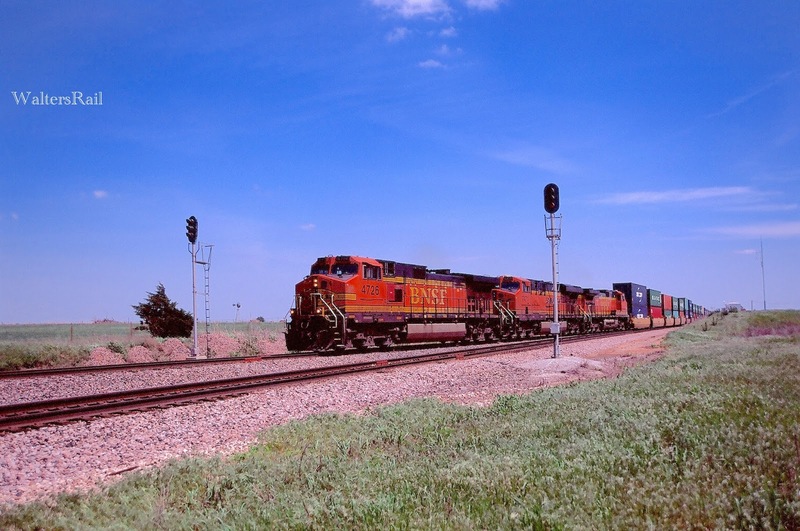 Above are westbound stacks approaching Morrison, Oklahoma. Trains on the Avard Sub can now race across northern Oklahoma at speeds as high as 70 miles per hour. 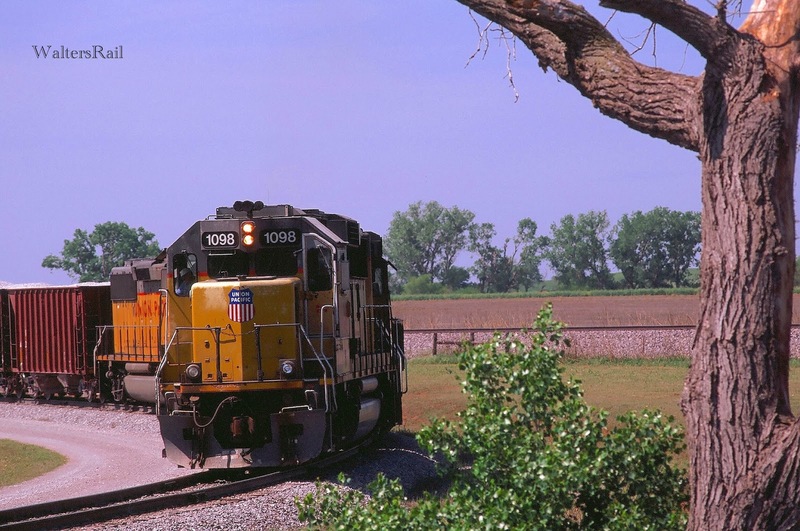 In eastern Oklahoma, however, the tracks wind through hill country, and high speeds are rarely obtained. 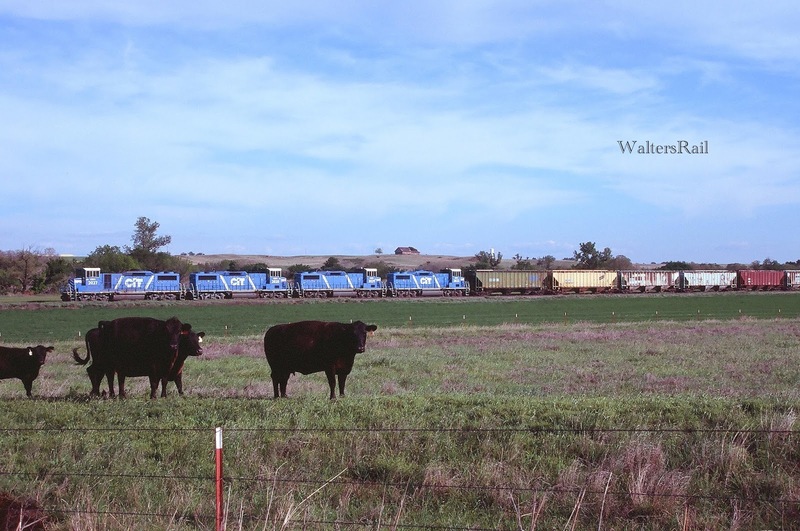 In central (where this image was taken) and western Oklahoma, the landscape opens broadly, the tracks straighten and trains run like greyhounds. These particular stacks almost blew over my tripod. Above is the same train in Perry, Oklahoma. The line in the background in the BNSF Redrock Subdivision. The Avard and Redrock Subs cross at Black Bear Junction northeast of Perry, then run roughly parallel into town. My mother and most of her relatives grew up in Perry, which is the county seat of Noble County and international headquarters of DitchWitch. 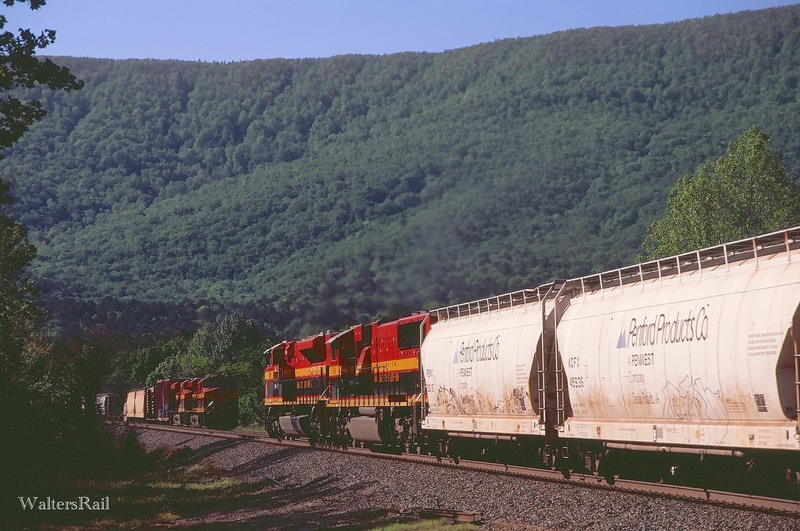 When both subdivisions are busy, the little town can see as many as 40 trains in a day. This is another example of an image taken in the middle of town which might easily be somewhere in the country. Here is a photo of a southbound grainer on the Red Rock Subdivision, taken from the same location as the image immediately above. In the foreground is the transfer track from the Avard to the Red Rock Sub. There is another transfer track from Avard to Red Rock at Black Bear Junction. The transfer tracks are set up to allow Avard Sub trains in either direction to transfer onto the Red Rock Sub when meeting trains from the other direction. Thus, in Perry, the Red Rock Sub operates as a long passing siding for the Avard Sub. Fort Worth dispatchers use this trick frequently. On our way to Enid, Dale, Mighty Dog and I drove along U.S. 81, which parallels the old Rock Island north/south mainline. In days gone by, this line was the scene of some massive derailments as the Rock slid headlong into bankruptcy. The Union Pacific, which now operates the line, has recently (2012-2013) completed a major track upgrade project. Because the line is "dark," trains are limited by federal law to 49 MPH. Were the line signaled, the tracks could sustain 60 MPH running for manifests and 70 MPH for intermodal traffic, were there any. The bulk of the traffic on this line nowadays is wheat, oil, coal and autos. As nearly as I can tell, the line sees six to eight trains per day, which may explain why we saw no mainline traffic that morning. There is a rock plant south of Enid, however, and we found a UP train loading rock on a large circular track. 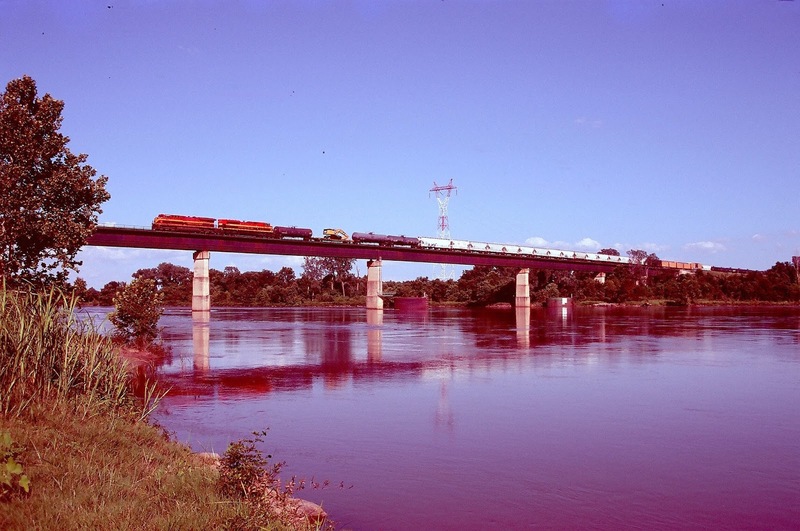 Above is an image of that train. The mainline is to the right of the head end unit. While in Enid, we stopped by the UP Yard to check on traffic. 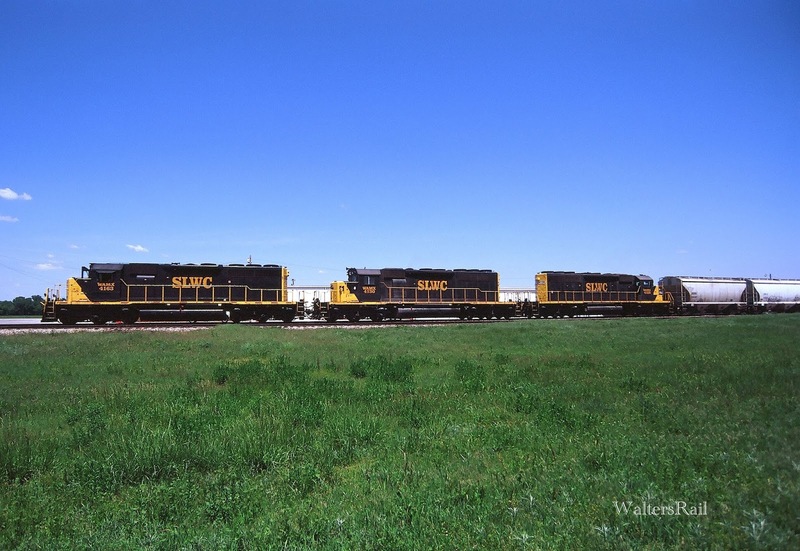 To our surprise, we found a southbound manifest leaving town with two "leaser" units and an old SP unit. Above is an image of that train. Behind the train is the small yard. 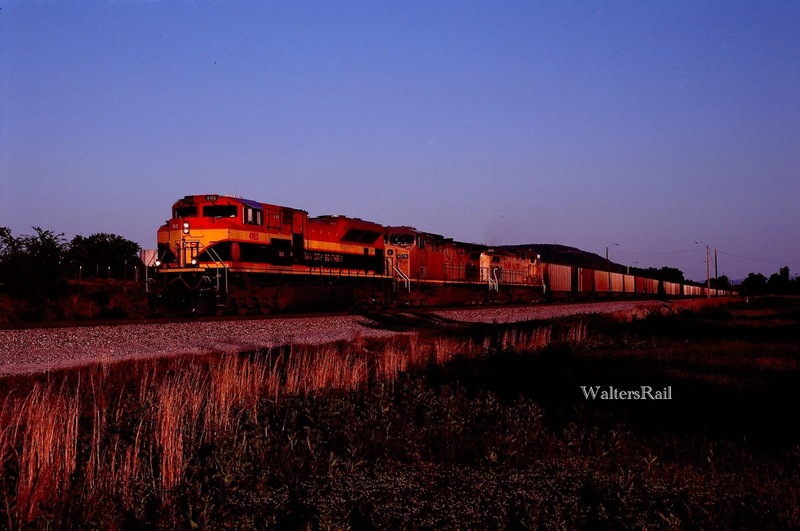 Another goal of the trip was to catch a train on the Stillwater Central, which runs trains from Stillwater, Oklahoma, home of Oklahoma State University, to Pawnee on an old AT&SF branch line, and from Sapulpa to Oklahoma City and on to Altus, Oklahoma, on the old Frisco mainline. When we drove to the yard office in Oklahoma City, rain was falling so hard that ducks were floating in the parking lot. I parked my Jeep under a road bridge, and Bear and I waited while Dale ventured inside to obtain train information. I honestly don't remember what Dale discovered, because I was considering building an arc. Dale took a few shots, while Bear and I closed our eyes and rested. 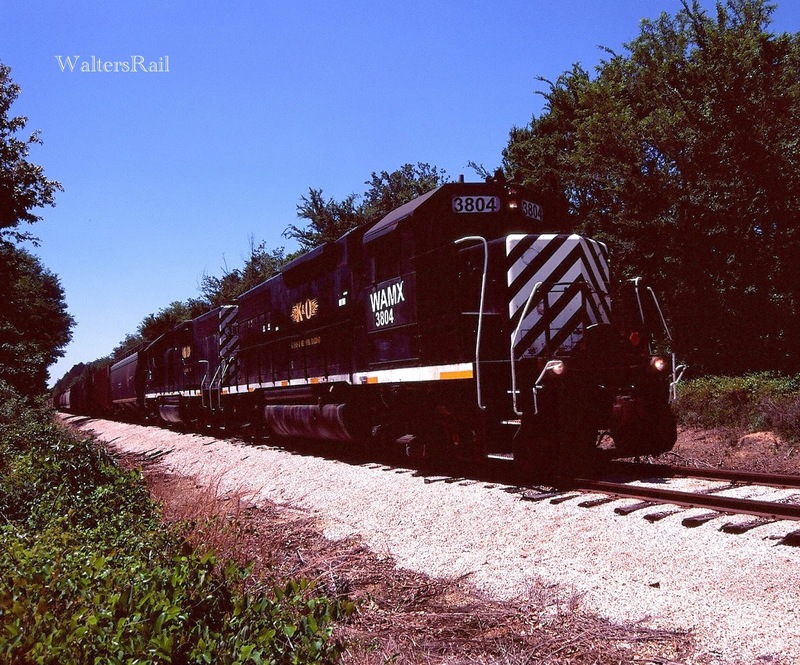 Two days later, however, the sun came out and we found a train running southwest from Sapulpa. We managed to take several shots, one of which is above, the other below. The one above is at Jones, Oklahoma; the one below at Luther. Had it not been for Dale's persistence, I would never have obtained images of this railroad, even though it runs through my backyard. The largest portion of our trip was devoted to the Kansas City Southern, one of my favorite railroads. While not a short line, the KCS is certainly eccentric enough for Dale's tastes. Also, the KCS runs through the Ouachita Mountains of southeastern Oklahoma, including the village of Page, for which my son is named. 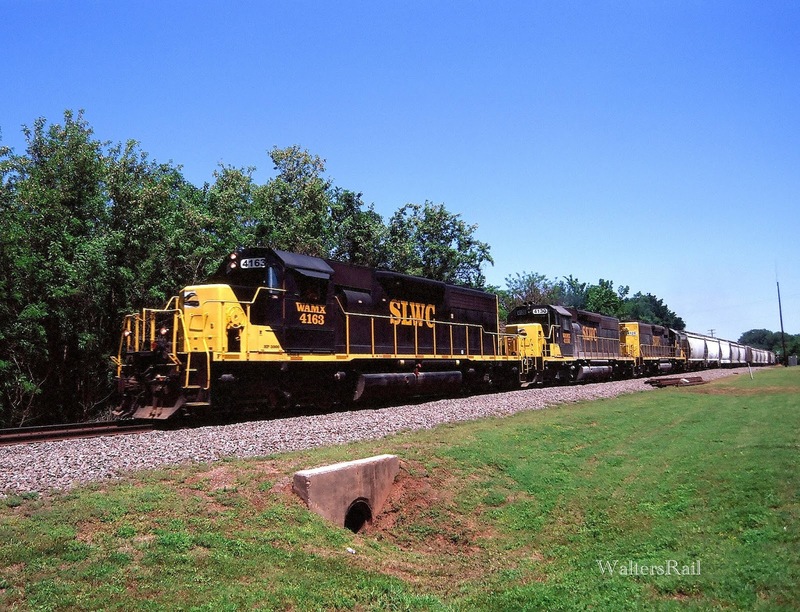 Heavener, Oklahoma, is a division point with a yard and office where train information can be gathered easily. 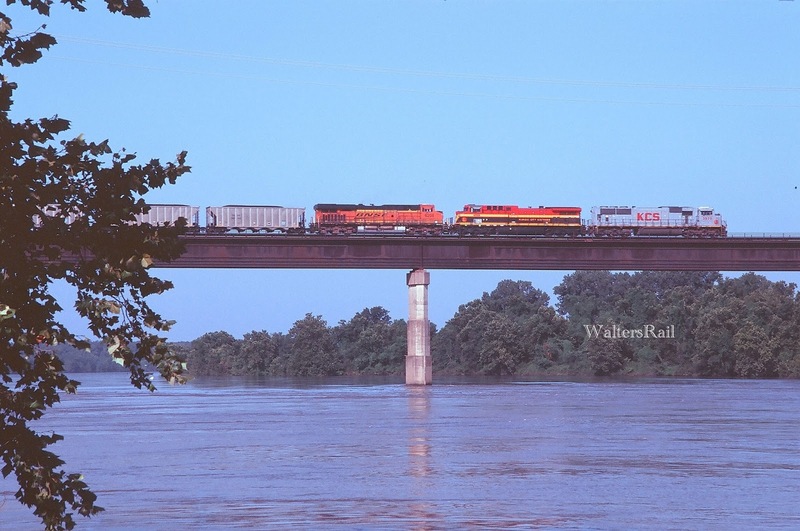 South of town, the KCS crosses the Poteau, the only river in Oklahoma flowing north, then heads south into the Ouachita National Forest. The foliage is extremely dense in this part of the world, and local knowledge is required to find the few available photographic opportunities. 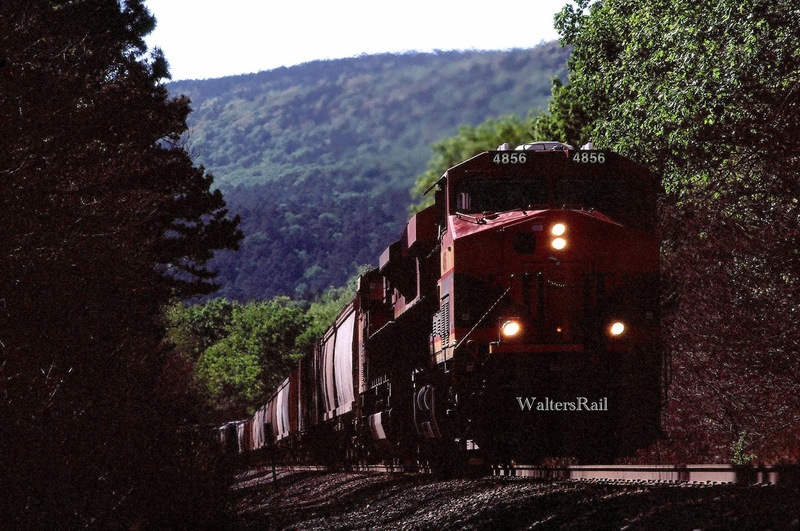 The best choice is to chase a train south out of Heavener and follow it along U.S. 270 as the highway turns east and heads toward Arkansas. The image above was taken of a KCS manifest as it leaves Heavener, heading to Rich Mountain. The image below was taken of the same train coming down off Stapp Hill. 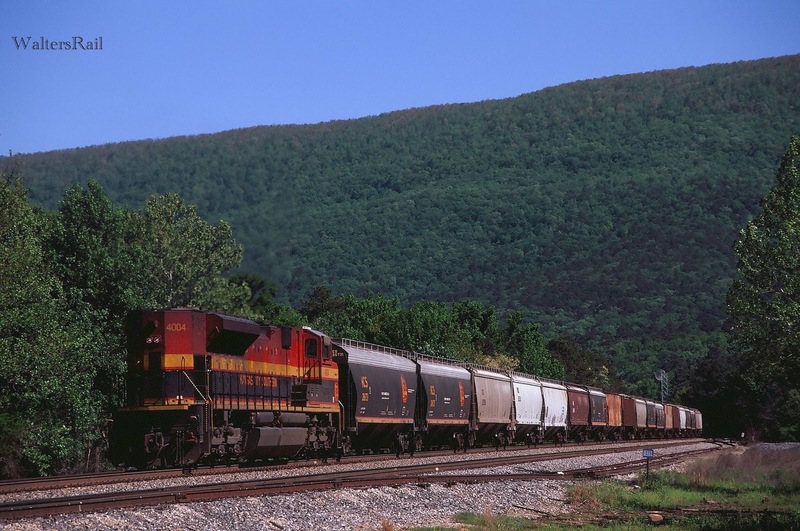 The shot at the beginning of this post is of the same train climbing the grade to Rich Mountain just east of Page. 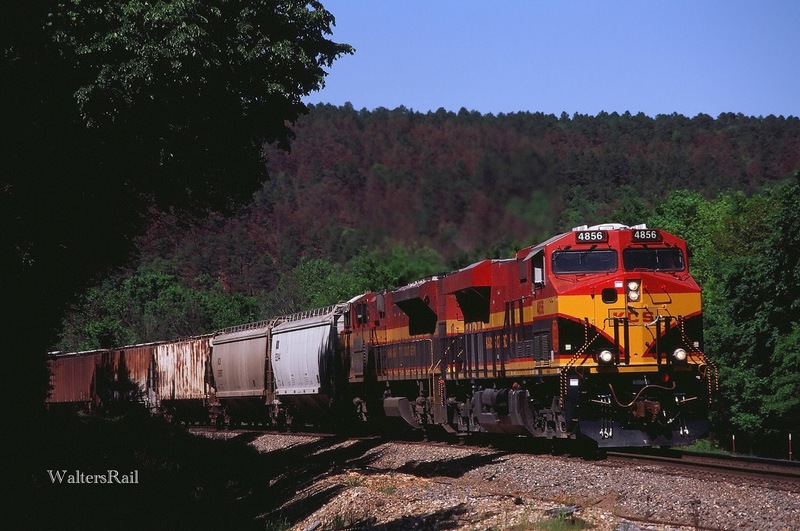 Trains awaiting crews often stop north of Heavener in an area adjacent to the old highway. The above image is of a DPU on a southbound manifest which left town after dark. 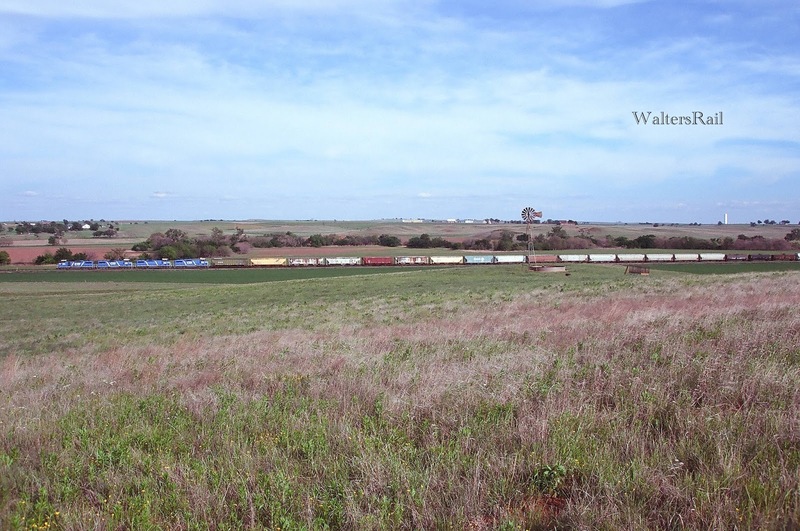 The image below is of a northbound, empty coal train waiting for a crew. Heavener is also a re-fueling stop on the railroad. So if you are looking to catch KCS traffic in Oklahoma, you should visit Heavener. Dale and I also attempted shots north of Spiro at the KCS bridge over the Arkansas River. There were two problems. (1) The sky was solid overcast with hints of rain. (2) Because of all the previous rain, the dirt roads into the bridge on both sides of the river were filled with mud-traps. Fortunately, my Jeep Rubicon is designed to handle extreme mud, so we had no problems. But we saw no trains. In June of 2015, I returned to the bridge and took the following images. In the intervening months, rain had continued to fall, and the roads had become even more mud-soaked. I did not get stuck at the Arkansas River, but I managed to strand my Jeep in a mud bog along the Verdigris River near Muskogee, trying to photograph UP's Okay Bridge. Were I more experienced, I would have taken a different approach in the mud that snared me, but I was not, and I got stuck. It will not happen again. I will not reveal how much it cost to get my Jeep free, but I will tell you that the only way the towing company could get to me was with a tractor, and the tractor just barely made it. If I hadn't been near the highway with cell phone coverage, I might still be in the mud. The north side of the bridge extends from the bluffs overlooking the river. There is no flood plan, which is why, no doubt, the engineers chose this location. The woods are heavy, and there are no real photographic opportunities except along the river bank where one can obtain an excellent shot of the full bridge in the afternoon. The flood plan on the south side, however, is vast -- over a mile wide -- and the tracks climb a long embankment before reaching the bridge. 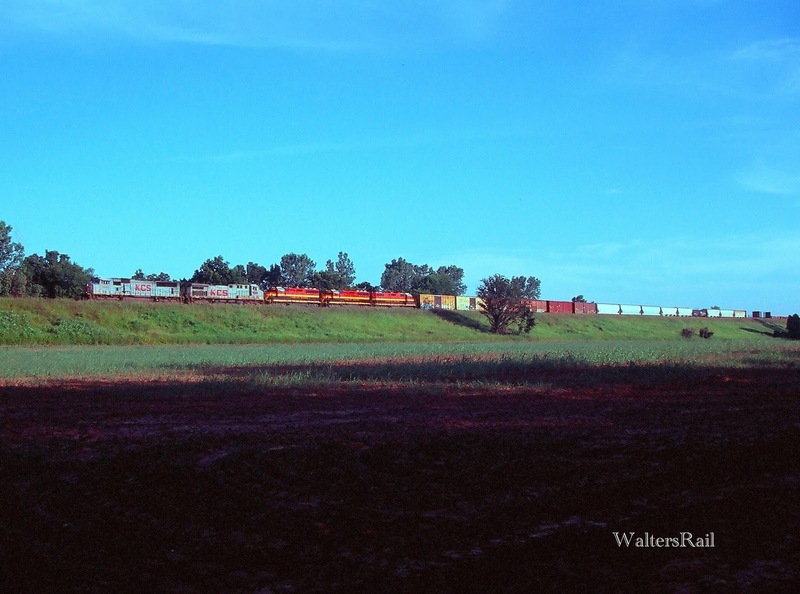 There are a number of good photographic possibilities of trains on this embankment, provided that you have a vehicle that can handle the mud in those flatlands. My Jeep has been up to the task, and I have to admit that I actually enjoy driving around in the muck. But I have never seen another vehicle in those mud flats, making me think that perhaps I am missing something. Or perhaps everyone else in the world is. In any event, when the shots below were taken, my Jeep took me to locations that I had only dreamed about years ago. My advice to would-be photographers is to wait until the fall. Even in a wet year, like 2015, the ground has usually dried out enough by October to make the primitive roads and trails passible. 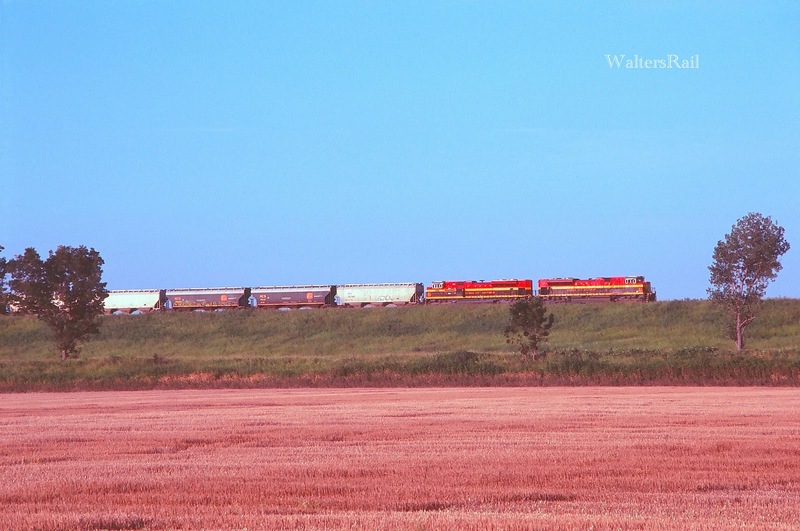 This is a southbound grain train leaving the bridge late one Friday afternoon. In the foreground is a partially harvested wheat field. To the right of the image stood several hundred yards of unharvested wheat and a combine that had, apparently, gotten stuck in the mud. It sat there forlornly with the wheat while I took this photograph. I assume that the ground eventually dried out, and the combine did the rest of its work. But when I was there, everything was a mess -- except the railroad. 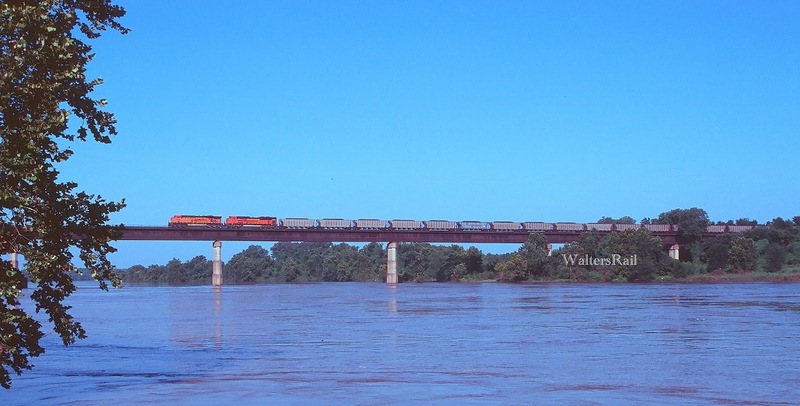 This southbound manifest is coming off the Arkansas River bridge shortly after sunrise. You cannot see it through the shadows, but the photographer is standing in a muddy, fallow field that had grown wheat in previous years. In the year of our Lord 2015, there was too much mud to plant, and too much to harvest. I drove my Jeep into the field, uncertain if I would be able to escape, but my worries were misplaced. Jeep technology came through once again. And, no, this blog is not paid for by Jeep. I just like my vehicle. Dale and I also spent a fair amount of time chasing FarmRail trains in the rain. 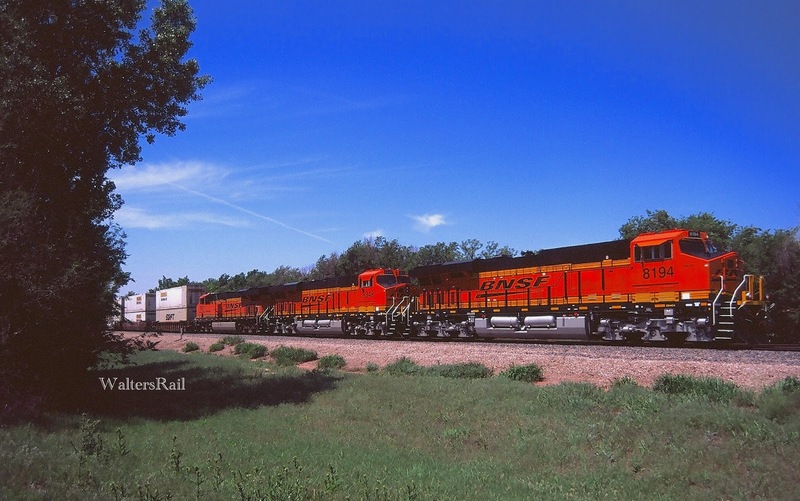 FarmRail runs a portion of the old Rock Island east/west line in western Oklahoma, as well as an old Frisco branch line from Clinton to Enid. Almost all of our images were taken under overcast skies as dark as the intestines of an elephant. Dale took several shots in the rain. I draw the line at exposing my ancient film cameras to moisture, although I am more than willing to explore photo locations on wet days. 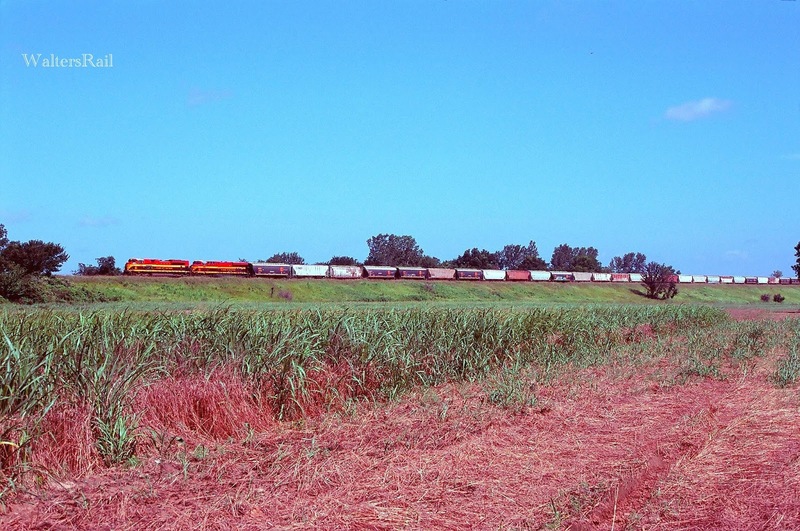 Below are two images of the same train -- a freight running from Enid to Clinton. Most of our shots of this train were taken underneath black clouds, but a bit of sun broke through as the train approached Clinton. As you will note, this particular train was running shiny new CIT Rail "leaser" units. We were a little disappointed at the lack of FarmRail power, but the train did look nice. If you want to see a bunch of photos of true FarmRail power under atrocious lighting conditions, contact Dale. 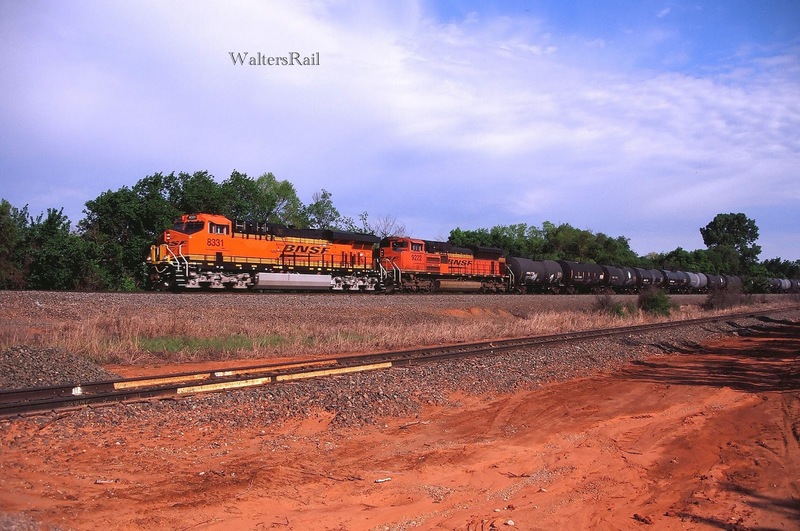 While were were in southeastern Oklahoma, Dale, Mighty Dog and I stumbled on a little known operation of the Kansas and Oklahoma Railroad -- a former KCS branch line from Heavener, Oklahoma, to Waldron, Arkansas. We had no information about this line at all -- no idea if trains were running or not. 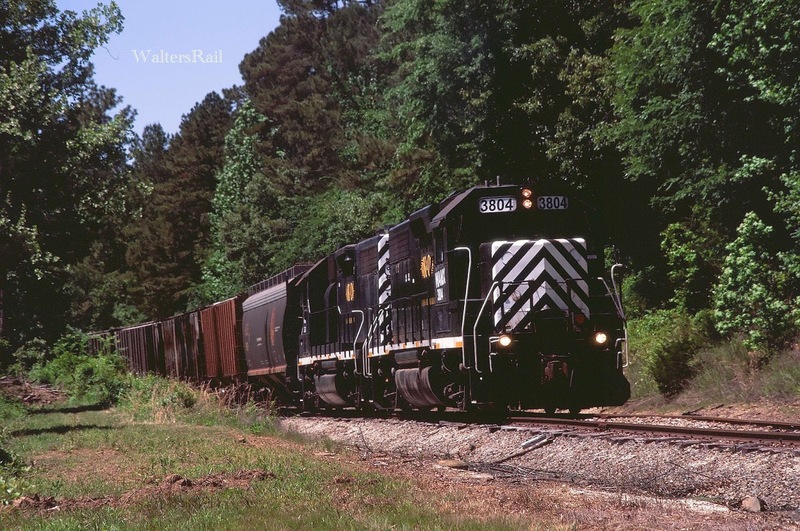 We did not even know what railroad owned the line, but on a whim we decided to follow the tracks east out of Heavener. 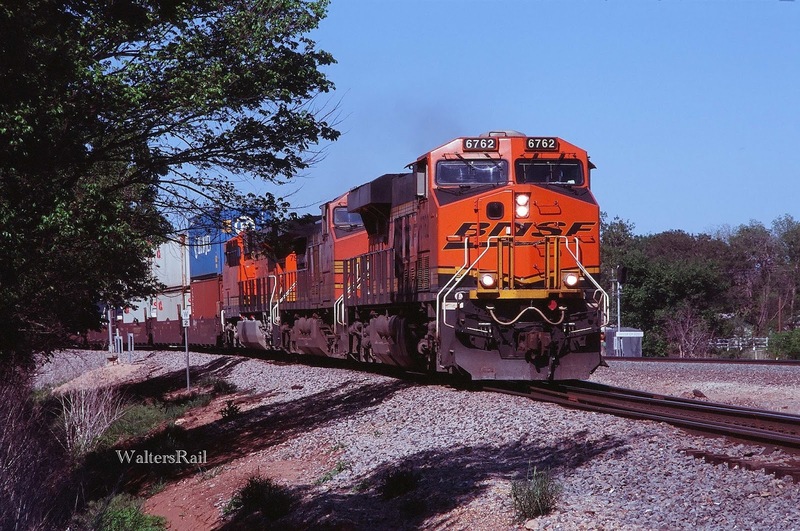 Must to our surprise, before we reached the Arkansas border, we discovered an eastbound freight. The conductor of the train was following the movement in a pick-up. He would drive ahead to each grade crossing, then wait for the manifest (moving about 10 mph) to catch up. Dale and I took a number of shots, then headed back to Heavener. This was probably the most pleasant surprise of the trip. Our final goal of the trip was to capture a shot of the Austin, Todd and Ladd Railroad -- named for the grandsons of the owner of the company. 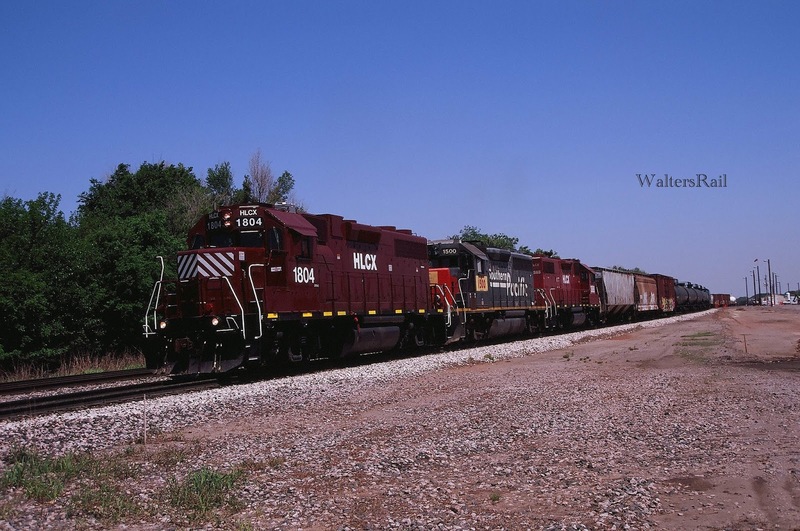 This is a true short line covering about 40 miles in west central Oklahoma, running from El Reno (and a connection with the old Rock Island yard, now the UP) west to Geary, then north to Watonga. About the only time you will see any traffic on this line is during wheat harvest in June. We were fortunate enough to catch a train just west of Calumet -- three engines and one car dead on the mainline. I don't know how long the train had been there, and I don't know how long it remained. When we drove through in the morning, the sky was overcast after a heavy rain. But when we came back late in the afternoon, the skies had cleared, and I took the following image. So 2015 was a very wet year. As I mentioned above, when I started this post, it was raining. I said to myself, "I wish it would stop raining." Shortly thereafter, it started sleeting. There are now about three inches of sleet on the ground. Be careful what you wish for.